I like my fish the same way I like my diet: sustainable. I’m a big fan of buying less desirable but highly sustainable cuts of meat and fish. Not only is it better for the environment, but also it is economical and forces one to be a bit more adventurous in one’s cooking. It’s not always easy though. Sure you have to do a little research of what is sustainable in your local area and season. You might also have to research what certain kinds of species of fish are on Google. Don’t be afraid though. Cooking is as much about the failures as it is about the successes. So try out that weird cut of meat, strange vegetable and unfamiliar recipe. You might find recipes that you can’t live without. 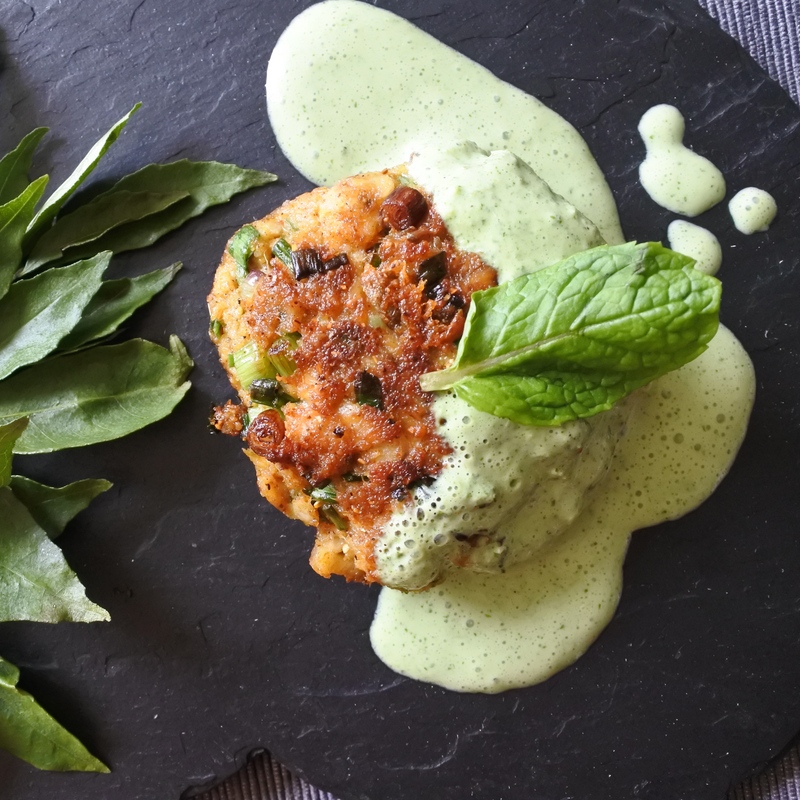 For me, this recipe of Indian spiced fish cakes with mint sauce is just one of those things. At first, I wasn’t crazy about hoki and hake fish. Both fishes are firm and flakey so you have to cook them just right for it to be delicious and not dry out which can be tricky. So, what’s the easy solution for such a meaty fish? Make fish cakes! However, I didn’t want to do the same old, boring fish cakes with a lemon sauce. My goal was for something more ambitious. Go big or go home, right? The solution was simple: spice it up with madras curry powder, add some citrus via lemon zest, and cool it down with a yogurt mint sauce. The end result is mighty tasty (if I do say so myself) and a dinnertime favorite. It’s easy to throw together, so if you’re in a hurry to put dinner on the table, this won’t take long at all. Serve over crisp greens and drizzle with the yogurt mint sauce for a light supper or with mashed potatoes and peas for a more substantial meal. Happy eating! These white fish cakes are seasoned with Indian spice and everything nice and accompanied with a yogurt mint sauce to help off set the heat. In a large skillet or frying pan, fry fish fillets, skin side down, in hot oil for 2-3 minutes, then flip and cook for an additional minute. Remove from oil, take off heat and let rest for 5 minutes. Ideally you want the fish to be partially cooked as it will be cooked additionally as a fish cake so don’t be afraid if it is a little undercooked in the middle. Chop fish up into coarse chunks and transfer to a large mixing bowl. Add Madras curry powder, breadcrumbs, egg, chopped scallions, salt, pepper and lemon zest and mix until thoroughly combined. Form into patties and fry in oil on medium high heat until golden on both sides. Serve with a yogurt mint sauce. Combine ingredients together in either a blender or food processor and blend until smooth. Let rest 10-15 minutes before serving.